Helps to suspend and keep your brace in place during activity. Supra Condular Pad is a unique and patented design which helps to suspend and keep your brace in place during activity. These items are sold as a single item only, not as a pair. Should I replace the supracondylar after all these years? Where can I buy more oval foam pads and covers that I have used on both sides of the knee hinge ? I cannot find these on the website. I have two questions. First, I wear an OAdjuster on my left knee and a Defiance on my right knee. I ahve the air condyle pads on my left that have helped alleviate the blisters, but I still get them on my calf. I believe that I am tightening the calf two tight in order to stablize the knee (calfs/thighs are huge (XL) compared to knee). How thick is the Supra pad and what is the material? Is the material compliant and could it cause the blisters to return? Would this be used on the brace while I am working out compared to the air pad which is more comfortable when I wear to work?? The supra condylar pad is not as thick as the air condyle pads, and it is for brace suspension. If you are getting blisters on your calf from tightening the straps too much, these pads, will not make a difference for that. I would suggest getting in contact with one of our sales reps and have them take a look at your brace and see if they can do some adjustments to the brace. I would also suggest looking at an undersleeve to help protect the skin, for when the brace does move around when doing an activity. do you just use it for one side of the brace? which side? 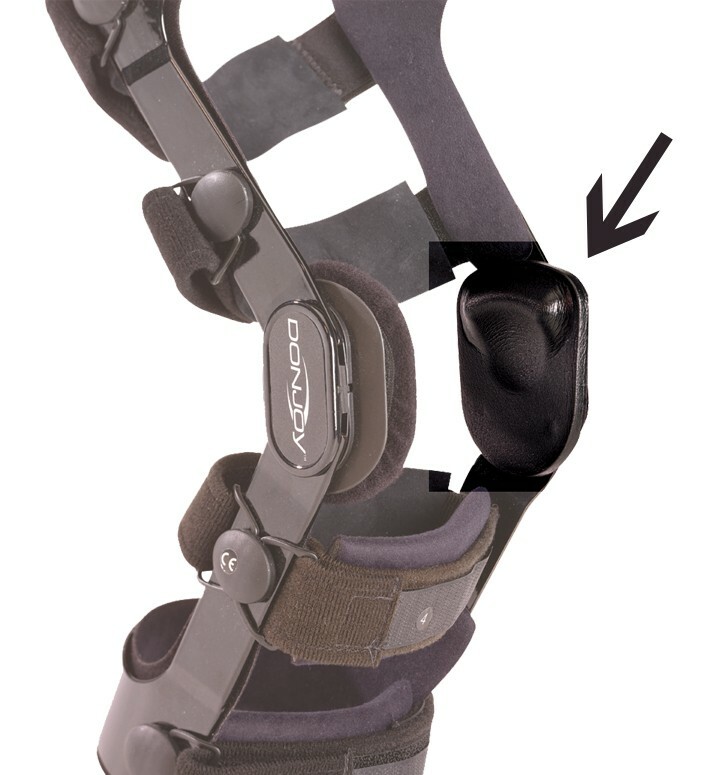 The Supracondylar pad is only meant to be used on one hinge and it's the one on the inside of your leg. The Ridge of the pad is supposed to sit on the top of the bony prominence on the inside of your knee. I hope this helps. Does this pad come with the cover that attaches it to the brace? The DonJoy Supracondylar Pad attaches with Velcro directly to the knee brace.